Uncaptured has long been an enigma. But Tuesday night at humble little Fort Erie racetrack in Ontario, Canada, jockey Miguel Mena seemed to have solved it, to have found the key to Canada’s 2012 Horse of the Year. The heavy favorite at 2-5 odds, Uncaptured dominated the CAN$500,000 Prince of Wales Stakes, the second jewel of the Canadian Triple Crown that is restricted to Canadian-breds. He won by a length in 1:55.49 for the 1 3/16 miles on a fast track, unleashing a burst of speed around the final turn, circling the small field from three, then five paths out from the rail. His margin of victory didn’t tell the tale of the ease at which he won. Mena had tucked away his whip, had folded his tent, had checked his watch for his next appointment by the time they hit the finish wire. But Mena’s race plan surprised, even “shocked” trainer Mark Casse, who expected Uncaptured to streak to the lead in the six-horse field. After all, early speed tends to be his thing. But no, Mena settled the colt near the back of the field in fifth position early, in front of only a 25 to 1 shot Rackman, who was never in contention as Power Phil and River Seven, a pair of 5-1 shots, battled at the front. “Going to the backstretch, I kept saying to myself: ‘I know he likes the dirt.’” Casse said afterwards. “But I’ve seen him run before and Miguel just kind of throws him his head and lets him go along and when he picks him up, he takes off. And I’m hoping that’s what he’s doing.” He was right. Uncaptured, a 3-year-old colt by Lion Heart out of Captivating, by Arch, was bred in Ontario by William D. Graham. He was sold at the 2011 Keeneland September Yearling Sale by Four Star Sales, with Casse signing the ticket as agent for $290,000. The colt had actually been among the early favorites for the Kentucky Derby last winter, but at vital points fumbled the ball. He lost a trip to the Breeders’ Cup last fall when his undefeated streak was dashed in the Grey Stakes, won by River Seven, at Woodbine. He was brilliant in winning the Iroquois at Churchill Downs last October, winning by 5 1/2 lengths over a field that included Overanalyze. But he lost his Derby trip when he finished only 10th in the Blue Grass Stakes over Keeneland’s Polytrack. And Casse took Uncaptured out of consideration for the Queen’s Plate when he was defeated by Pyrite Mountain in the Wando Stakes at Woodbine, over another Polytrack. Casse regrouped, and listened to what Uncaptured was telling him: He wasn’t so crazy about Polytrack. He had run well at Churchill, a dirt track that is very much like the Fort Erie dirt surface, Casse said. And Uncaptured answered another question: he can win at 1 3/16 miles. When the field was bumbling along at a 25.27 rate for the second quarter mile, River Seven began to challenge Power Phil for the lead. The fourth quarter went in 23.92. After taking the lead at the head of the stretch, River Seven finished second for trainer Nick Gonzalez, who had won the Queen’s Plate with Midnight Aria. Gonzalez gave the Plate winner a rest, figuring he was a little worn out from his efforts. Third in the Prince of Wales, 4 1/2 lengths back was 12-1 shot Niigon’s Glory. Casse’s other entry, Jagger M, finished fourth. Casse ended up starting only two horses, although he had entered four by the Saturday deadline: half the field. He scratched Plate Trial winner Dynamic Sky when the horse showed up lame after a training session on Monday. It hadn’t been a good week for Casse. He’d intended to start Funny Proposition, the filly who had upset Royal Delta in the Fleur de Lis Handicap, in a stakes race at Monmouth last weekend, but had to scratch when she came out of her stall lame at 10 a.m. on race day. Casse had shipped her to Monmouth and Mena had flown in. And Spring in the Air, which would have been the only filly in the Prince of Wales, was scratched when Casse and owner John Oxley had a chat. Oxley asked Casse if he really thought the filly was good on the dirt. Casse wasn’t absolutely sure. They decided instead to opt for the Wonder Where Stakes, the third jewel in the Canadian filly triple tiara next weekend at Woodbine. Casse also won the Prince of Wales Stakes last year with a filly, Dixie Strike, and recalls fears that the race – in its 78th running this year – might become extinct after the provincial government’s dismantling of the slots-at-racetracks program last year. Fort Erie was one of three racetracks that had the slots removed altogether and it seemed destined to die. “I remember people last year saying this will probably be our last year and I said: “I wouldn’t bet on that one,” Casse said. On March 31, Fort Erie struck a one-year deal with a government three-member transitional panel to operate this year. Chief operating officer Rick Cowan said the track and the horsemen “scrambled like crazy” to get the horse inventory up to a point where they could race three days a week. They had to cut it down to two days a week, but have found the experiment working well: Cowan says wagering is up on-track and attendance has increased by about 10 to 15 per cent this season. So does Casse. He’d hate to see Fort Erie and its Prince of Wales tradition die. Besides, his escapades to Fort Erie have also doubled as a family vacation at nearby Great Wolf Lodge. “We’re going to be sliding down those slides tonight,” he said. 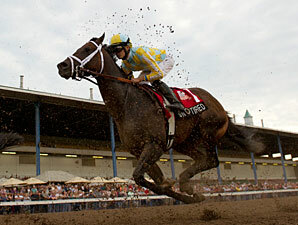 Uncaptured will spend a week at Woodbine, then ship to another of his favorite tracks, Churchill Downs. A trip to the Travers Stakes over Saratoga’s dirt surface doesn’t seem likely, however. Casse saw Verrazano’s victory in the $1-million Haskell last weekend. “I think I’m going to go where Verrazano isn’t,” he said. “He was pretty awesome the other day. I don’t want to mess with him any more.” Casse raced a nice colt once against Verrazano at Gulfstream, after hearing that he was the best in Todd Pletcher’s barn. His go-to jockey, Patrick Husband, said: “We’ll find out.” Casse’s colt finished 17 lengths behind him.